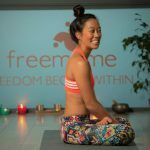 Hi Yan 🙂 I’m currently recovering from a whiplash injury after a car accident – how and when can I incorporate yoga into my recovery? I’m currently a little bit terrified of returning to class. GET YOURSELF THE ALL CLEAR. If it was a serious whiplash injury or you have ongoing and worsening symptoms, make sure you see a doctor and get medical imaging to give you the all clear. We need to make sure there’s no underlying fracture of disc damage or even head injury for example. Get the all clear from the doctor to start physical activity. In the first few days or weeks depending on the severity of the injury, your tissues will be in a state of acute inflammation, meaning it will be hot and swollen as increased blood and fluid collect in the area. You may feel this as acute throbbing or burning pain at rest or with minor movement. The body usually tells you… ‘do not move’. Listen to it. Rest. Keep the neck still and steady. Ice it. Compress it gently. Keep the head and neck elevated. Close your eyes and just spend a few moments feeling your neck as it is, without trying to move it… this awareness alone can often bring healing to the area, allowing a softening and letting go, a de-contraction of tense muscles. Once the symptoms of acute pain and swelling have settled completely, meaning there’s no pain at rest when you don’t move the neck, then you can very gently explore opening up the tissues again through mindful and super slow gentle neck movements. Don’t even use the hands but just move from the neck itself in all its various directions, flexion extension, lateral flexion, rotation, circumduction. This way you’re likely not to overdo it and you get the added benefit of activating the neck muscles gently to bring more energy flow back into the neck muscles as well as gentle stretching of the connective tissues. As well as neck movements, you’ll probably benefit from the same gentle ‘active dynamic, non assisted’ shoulder girdle and shoulder stretches. Meaning no yanking your way into a stretch..stay with conscious active movements directly at the joint. I.e. shrugging shoulders up to ears and drawing them back down, shrugging them forward and back. moving the arms in all directions. It will slowly bring life and openness back to the myofascial tissues. In essence, this is already yoga therapeutic practice. Mindful movement, paying attention in a particular way, listening to your body. If you experience acute pain, slow down. If it feels OK to deepen then deepen. If it feels good to hold, then hold for a a little longer. We can only really take it moment by moment like this if you are to really listen to and honor your body. And don’t forget the rest of your body. Explore also, how the rest of your body feels and might have been affected with gentle movements. The process of opening the tissues again after injury will require that the fascia gets pulled, stretched and ironed out again, breaking down any scar tissue formed. This by its very nature will cause discomfort. Explore the sensations. Aim for a nice deep pulling/stretching feeling like a good thai massage and see if you can relax into that. However any sign of acute sharp pain, or if the swelling and throbbing return, then go back to resting until it settles. If the tissues are tight and fragile, there will be a lower threshold for another tear, so take it easy and be super patient. Once you gain back a decent range of motion in your neck, shoulder girdle and shoulder joints with seated exercises, then start to explore a gentle self practice, alone and undisturbed. This can be both gentle dynamic movements and more Yin type static surrendered holds. When we are recovering from injuries or suffer our own personal illnesses, I believe the best thing we can do is be completely present with our bodies. Often in class, we aren’t truly paying attention to our bodies because we are listening to the teacher, the music, looking around. Our focus and attention is constantly being drawn out of our body. It takes time and practice to get to the place where we are really truly holding our awareness in our body and feeling and directing it with full consciousness. Until we gain that self discipline and concentration, removing all distraction and stepping onto your mat alone and in silence is the safest way to begin practice, listening to your body and feeling it as you move. Start with gentle warm ups, cat cow, table-top variations. Then see how down dog feels and begin to work your way back into that, holding for a few breaths. Once down dog feels good, then explore the sun salutations, modifying as you need to by dropping the knees until power comes back into the core and shoulders to hold chaturanga. Try a few gentle standing postures. Explore and play like a child. Curious, without fear, open. Respond appropriately to the feelings from the body, pulling back or exploring deeper governed by what you are directly experiencing. You can probably join restorative, therapeutic, Yin and even gentle Hatha classes sooner once the acute phase has completely settled and the acute pain has stopped and you have worked a little more movement back into your neck without too much pain. I’d say that once you’re happy flowing through a few sun salutations in your own practice, without too much discomfort and holding a few basic standing postures, then you can think about going back to a dynamic Vinyasa class. The only reason being that we never know what’s coming in a guided Vinyasa class and because of the nature of a constantly moving class, it isn’t possible to give individual attention and modification in every moment. Group classes, particularly fast paced classes, I feel are only really appropriate for those in full health. Only those with minor recovering injuries and a lot of body awareness and knowledge of how to modify their own practice in class should join at their own discretion. I really hope this information helps anyone who needs it. Got a question? Feel free to message me. Always happy to share my thoughts with you all.